As the year comes to a close, I wish each and every one of you a Merry Christmas and a warm and wonderful new year. We’ve been making the rounds to our usual holiday gatherings, taking a day here and there to visit with old friends and new. It makes for odd hours at the office, but the smiles and laughter are a wonderful addition to our daily routine. Whatever your plans, and wherever you are, I hope you are able to take some time for yourself, spend time with friends and family — or simply do the things that give you great joy. While we usually think of stencils as tools to use with paint, they are very useful any time you want to create a specific shape, regardless of your materials. 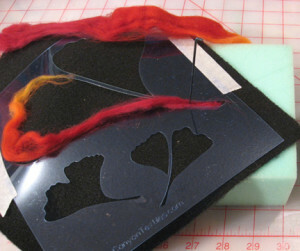 In today’s lesson, we look at how to use stencils with needle felting. 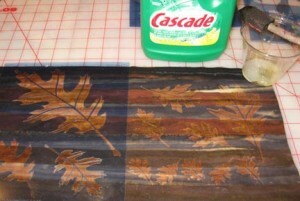 Whether you work by hand or machine, stencils make it easy to create beautiful shapes with your fibers.